After finally managing to score last night in a win, the Dodgers followed that with their second win of the season in a dominating 9-0 shutout of the rival Giants to even the opening series of the season. The concern about Rich Hill being a mess during Spring Training is an annual event at this point, and given his age, it’s definitely understandable to have concern. However, Hill took the mound today and provided six shutout innings, allowing five hits and three walks while striking out five. Hill had to work out of bases loaded jams in both the third and fourth, but otherwise looked like his normal and glorious smoke & mirrors self. I'm aware of spin rate and how his curve keeps them off it, but Rich Hill getting away with throwing 89 mph right down the middle is still amazing to me. On the other side of things, Giants starter Chris Stratton no-hit the Dodgers through three innings, but thankfully that didn’t last in the fourth, as Corey Seager and Yasiel Puig both singled to start the inning. Later, with one out, Seager scored from second on a … Cody Bellinger fly out to left? Yeah, that happened, because Puig totally meant to get caught in a rundown or something. They continued to cling to that 1-0 lead until the sixth, when the bats finally awoke and blew the game open. Chris Taylor started the inning with a double to left, and with one down, Puig lined a double to the opposite field to plate a run. Yasmani Grandal then followed with what somehow ended up as a single to left — because his feet are cement blocks — to score a run. Bellinger then followed with his first hit of the season, and thankfully that hit was an oppo donger to make it 5-0. The offense didn’t stop there, as in the eighth inning they put up another crooked number. Three consecutive singles from Puig, Grandal, and Bellinger loaded the bases for Enrique Hernandez against a righty. Enrique certainly seemed determined to buck his career trend, as he smacked a double to score two more runs. Enrique was 2-for-3 against righties today (and you can totally read about the adjustments he made), so here’s his nice swing. 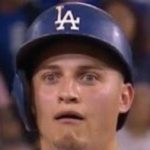 A Joc Pederson ground out drove in another run to make it 8-0, and then Austin Barnes capped off the scoring with a single to push things to 9-0. Meanwhile, the Dodgers bullpen was stellar again, with the trio of Tony Cingrani, Josh Fields, and Wilmer Font combining to get a scoreless inning each and surrendering only a single hit. So far for the Dodgers, Clayton Kershaw has the highest ERA among starters and Kenley Jansen has the highest ERA among relievers. April Fool’s Day indeed. The Dodgers are now 2-2 on the season and will face the Diamondbacks tomorrow at 3:40 PM HST/6:40 PM PST/9:40 PM EST. Hyun-Jin Ryu will take the mound to make his season debut against Taijuan Walker.